Sameer and his team made ProProfs very easy to use. There are vast amount of options available when creating a tool online at ProProfs, yet it doesn’t make things complicated for anybody to use. The user doesn’t need to learn how to code or convert files. ProProfs uses every advantage of HTML 5 to let users drag and drop almost every file and lets ProProfs do all the work. For example, a user can create an online tutorial by uploading a PowerPoint presentation file or uploading a video and not converting the file to a specific format. Even users who don’t have PowerPoint or a certain video player can view or edit any of those files through ProProfs by the magic of HTML 5. There are barley any obstacles or restrictions a user faces when creating a tool; thus making life a lot easier when it comes to using ProProfs. Simplicity and its comprehensive tools put ProProfs on another level. A knowledge database is coded into the system and allows users to gather information from other publicly free tools created on ProProfs. Say a new user is creating a new quiz based on accounting. Instead of thinking of new questions, the user can browse and search for other online quizzes stored in the knowledge database and pick and choose different questions from other quizzes. The team behind ProProfs has researched and taken customer feedback to create such a comprehensive online tool. Creating an online class or tutorial is simple on ProProfs. The amazing thing is users can create classes and tutorials based on individual performances. Have a student or trainee failing a certain part of the course? Create an extra quiz or class to help them understand. See detailed outlines of each student/trainee progress by viewing how they are doing on each quiz and see how many of them successfully answered a question. The options are pretty much endless and that is what makes ProProfs such a great tool, especially for large companies and universities. Another reason why ProProfs is used is because of its simple price point. ProProfs has a free online quiz maker, which is more than enough to bring in customers to see what else ProProfs has to offer. There are various pricing points to purchase depending on what options the user wants. Pricing is not based on the number of people who use your tools or the amount of bandwidth available. It is a simple monthly fee users pay and get the benefits of using a great tool. Luckily, ProProfs always has a deal or two going on, so finding the right price point is always a possibility. 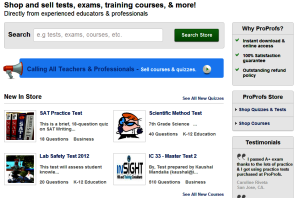 ProProfs also gives users the ability to buy and sell quizzes, classes, and tutorials to others. A direct transaction fee is applied to each sale if the transaction is directly through ProProfs, but it is available to both free and monthly paid members (members get charged a smaller fee). Using an external payment source such as PayPal, can allow free and paid members to bypass the transaction fee. Options like selling quizzes for free and an extensive options list for each tool create a “delightful” atmosphere for customers. Customer satisfaction is not enough for the team; they want customers to feel more than satisfaction. ProProfs grows through by customer feedback and giving back great customer support. Because of this outlook, customers are giving word-of-mouth advertisement for ProProfs. It is giving them more business and a growing customer base. ProProfs has only been around two and a half years, but it’s already one of the biggest online tools available in the market. All that has been written so far is just scratching the surface on what ProProfs has to offer. The comprehensive tools, simple layout, and the customer fan base have put ProProfs on a level you just can’t miss. The pricing and the options available are second-to-none and with its word of mouth advertisement are keeping ProProfs at the top. ProProfs has outlasted its competitors and others are just trying to keep up. The future looks bright if they follow their rules and commitment, it’s what got them here in the first place. Try out the online quiz maker for free here. To see what else ProProfs has to offer click here. I’d like to add in QuizPoo – it’s a fun and free way to make a quiz http://www.QuizPoo.com. Just stumbled on it the other day!